Leupold Mark 6 3-18x44mm (34mm) Riflescope: “Game-Changer” First-Focal-Plane Tactical Rifle Scope/Hunting Scope with Horus H58 Illuminated Gridded Reticle (or TReMoR2 or CMR-W Reticles) for U.S. Military Special Operations Forces (SOF) Assaulters/Snipers, Civilian Tactical Shooters and Hunters! (Videos!) | DefenseReview.com (DR): An online tactical technology and military defense technology magazine with particular focus on the latest and greatest tactical firearms news (tactical gun news), tactical gear news and tactical shooting news. Leupold tactical scope reps recently showed DefenseReview (DR) the Leupold Mark 6 3-18x44mm (34mm) Riflescope first-focal-plane tactical scope with a 34mm main tube and Horus H58 illuminated reticle (gridded reticle) with wind dots (or Horus TReMoR2 or CMR-W reticles) at NDIA Joint Armaments Conference 2012. While we were at the booth, a U.S. Military Special Operations Forces (SOF) assaulter/operator/sniper graciously explained it’s combat attributes and described the new scope as a “game changer” in terms of the combat capabilities that it provides for the end-user. We won’t disclose which unit the SOF assaulter/operator is from, other than to say that he’s one of the guys T&E’ing cutting-edge combat hardware/technologies for the rest of U.S. Military SOF. Editor’s Note: Click here to visit the Leupold Mark 6 3-18×44 M5B2 Riflescope product page at G&G Rifle Scopes and receive a $100.00 USD discount on your purchase of this item. The promo (promotional) code for the discount is “DefenseReview”. 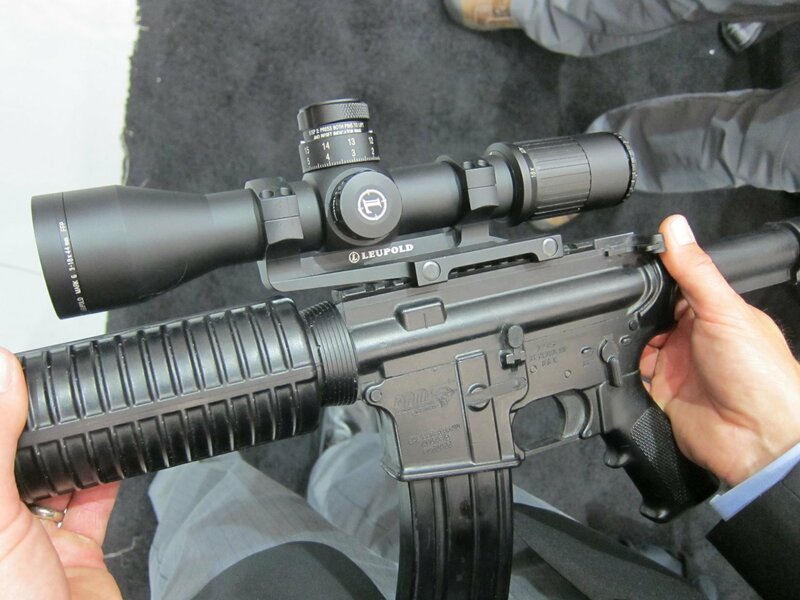 Leupold Rep: It’s under 12 inches. 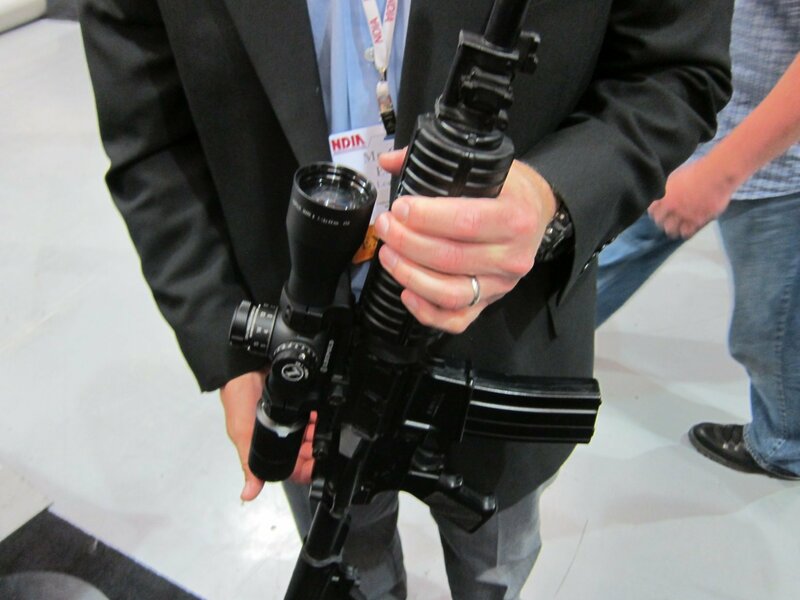 SOF Assaulter: 9-10-inch scope. So you have a lot of magnification in a very, very small package with this. David Crane: So what’s the range envolope [with] this, in terms of combat? Leupold Rep: How far you can shoot out? SOF Assaulter: It comes down to what you’re shooting. The nice thing about this is it’s not…this scope doesn’t have to stay on a 5.56 platform, 7.62 platform, .300 Win Mag, .338. You can shoot it as far up as you want. Because of the reticle in this, all you have to do is change out your ballistic program in your ATRAC computer, and it gives you the exact hold that you need to shoot what you want to shoot. Crane: Right, but ideally, what combat application is this scope designed for? Crane: Right, but you wouldn’t want to use this for, let’s say, CQB [Close Quarters Battle], would you? Leupold Rep: Well, with the addition of a, say a mini-red dot, you absolutely could. And 3-power, you can back it down. You can use your complete suite of night vision, thermal sights, clip ons. And at 18 power you’ve got positive [identification]…even if you can’t shoot beyond 18-power, do you need 18 power to shoot a 5.56 gun? No, but you [can] get positive ID on a target out to well beyond 1,000 meters, so you can identify the threat well before you see them. Crane: Right, or you can stick this on a M110 carbine, or whatever. Crane: What’ the importance of the zero stop? Leupold Rep: So when you set your zero, if you get lost in your turns, you can always dial back to zero and star again. It’s got positive clicks, or clunks, every 10th mil, and then every 5 mils, it’s got a positive clunk. So, at night, you can do it quick. 5, 10, you don’t have to count “1, 2, 3, 4 5”. You can do it a lot faster. Crane: You were just saying…you think this thing is a game changer? Why is it a game changer? SOF Assaulter: Absolutely. The reason this scope is a game changer, is because for far too long, people have been using simply a mildot reticle. With the increases in technology over the last five years, sniping is a completey different game than it used to be. And, with utilizing a gridded reticle, people now have the ability to do sniper-sniper operations with increased magnification on their scope and increased hit probability. This is due to the fact that they can call their own winds, they can do their own math and their own data simply using this scope and a computer program. Crane: And part of that equation is the Horus reticle? SOF Assaulter: Yes, it’s known as a gridded reticle system. The one in the Leupold Mark 6 is the [Horus H58]. They also make the Tremor-2, the Tremor-1 and the [H-59], as well. Crane: What’s the one that you like? SOF Assaulter: Pretty much all of them. I’ve shot the 58 all the way through the 59 and the Tremor-2, and, honestly, they all work very, very well. Crane: But this one’s the [H58]? SOF Assaulter: That’s the [H58], and it is very fast, it’s very accurate, and it’s a very intuitive scope, as well, which means, as a novice shooter, somebody can pick it up, do a little work with it get a couple classes and be very, very accurate with this weapon, with this optic. Crane: And what’s this scope runnin’, right now? 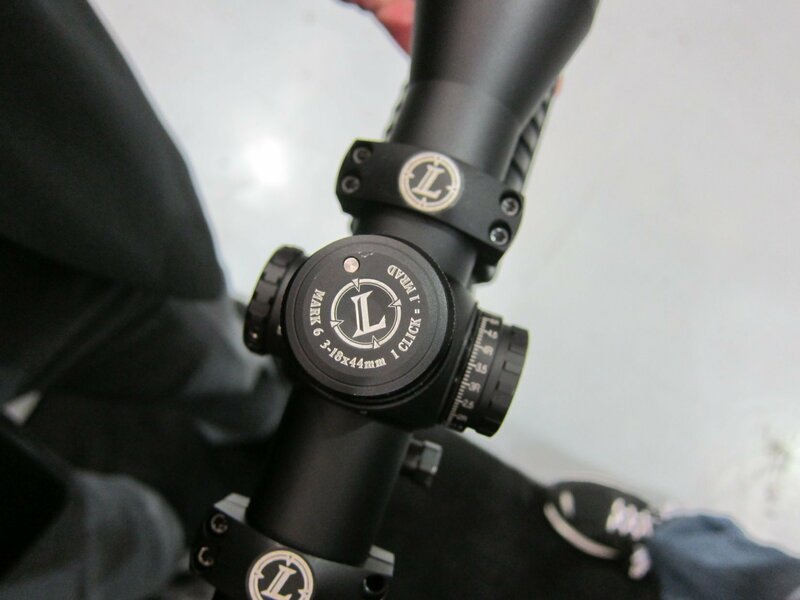 Leupold Rep: Retail’s gonna’ be $2500, roughly. Leupold Rep: Nah, it’s not crazy. And the reason it’s not crazy is because you can put it on so many different weapons platforms, it’s not just a sniper application. Crane: Right, you can put it on a 5.56, on a 7.62, a little 7.62/.308 carbine, or an M4A1, or whatever…or a sniper rifle. You can stick this on a full-length rifle and go to town. Leupold Rep: Absulutely, ’cause it’s light. I mean it only weighs 23 ounces (23 oz). Crane: So, we’re just talking about actually using the gridded reticle, and you were saying, just in terms of how it works and what you would do in terms of, let’s say, a tactical application based on distance change, or whatever. So, let’s talk about that very quickly. SOF Assaulter: One of the nice things about the gridded reticle is that it can be used between multiple shooters. And, one of the cool things about this is, let’s say you’ve never shot this rifle before, I get hit, you have to pick up my rifle and take a shot. Now, instead of spending the time to do a hundred (100)-meter zero with this thing, all you have to do is pick it up, take a blank wall at a relatively known distance, take a shot and watch where that shot falls. Now, wherever the shot falls within that gridded reticle, that’s your point of aim. So, it’s that quick. Crane: And then you’re using the grid to figure out where to put every other shot. Crane: So, in other words, you can gauge it…even if it’s not hitting point of aim in the reticle, you can gauge it by the grid. Crane: So you can really dial it in. Crane: Very cool. Alright, thank you. SOF Assaulter: It’s very user friendly. “The Mark 6 3-18x44mm sets a new standard for high performance in a small, lightweight package. with a length of just 12 inches and weighing in at 23.6oz, this optic sets the standard for high-end riflescopes and is 20% shorter and 20% lighter. In addition, the Mark 6 series offers state-of-the-art tactical features that are common throughout Leupold’s Tactical product line. Hands down, the most commonly used phrase we hear from tactical end users is, “smaller, lighter, faster” when describing the perfect optic. 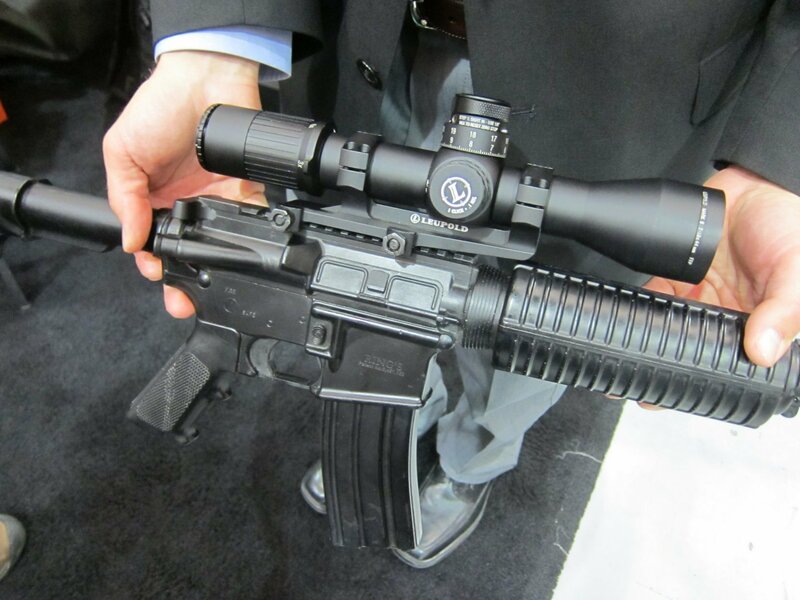 Leupold Tactical Optics; we listened. And delivered.